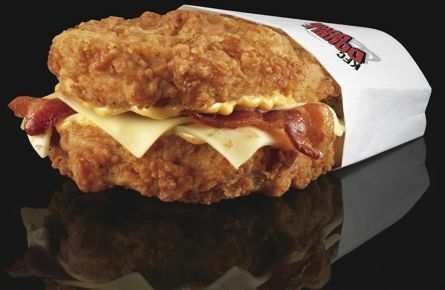 When I heard about the launch of the Double Down in the US, all I could think of was “genius.” A sandwich of bacon, cheese, and two pieces of KFC’s original recipe chicken breasts with no room for a bun? Beautiful. Deep fried goodness! If America is good at something, it’s fast food. I always make an effort to eat fast food when I’m in the US. There’s just so much variety, fast, and all kinds of delicious unhealthy, and usually cheaper than prices in Canada! I was sad to hear the Double Down was only available south of the border, but my heart leapt with joy when I read on some news website that the sandwich would be made available in Canada for a limited time. I was excited again when I saw a KFC flyer in the mail within days of reading the news, with the Double Down sandwich proudly featured all over it. I got even more excited when I read and heard on the news about how experts, doctors, nutritionists, and other humans were disgusted about the amount of calories and sodium this one fast food menu item had (actually, I wasn’t to thrilled about the sodium, but hey its fried chicken). I was excited for the hype. I like fried chicken. So I told myself I would try it, and I did. I went and bought the Double Down sandwich a few days ago for $6.99 ($7.83 total with HST; the combo was priced at $8.99) and apparently I had a stupid grin on my face as I walked out with my takeout bag, or so I’m told. I hadn’t had KFC/friend chicken in a long time. Did I mention I liked fried chicken? Under normal circumstances, I would have cringed and debated for a long time at the price, because lets face it, I’m Chinese. But I thought, this sandwich has to be worth it, because, its fried chicken, cheese, and bacon…TOGETHER! But I now know, its not. This was my first let down. Also, as a Christian I believe in good stewardship of money and so paying almost $8 for one item of fast food isn’t worth it. Honestly, doesn’t that look deliciously beautiful? Look at that crispy batter skin. Look at the golden brown of fried perfection. Look at the tantalizing pieces of bacon hanging out of the side, waiting to be nibbled. Look at the sauce smeared with love, as processed cheese peeks playfully from the inside of the sandwich. This is what I expected. I concentrated in marketing for my BBA degree and I did not clue in. Sigh (and also consumer FAIL). There was a lot of processed cheese. As you can see, it hadn’t really melted. There were only two pieces of bacon, and they were maybe about 3 to 3.5 inches in length. The top chicken “bun” was comparably smaller to the bottom “bun.” I do not remember tasting any special sauce. I will give credit, in that they were two delicious pieces of white chicken breast. I will give a thumbs down on the crispy batter. There wasn’t a lot of crisp to it. The eleven herbs and spices of the original recipe batter were not as aromatic as fried chicken pieces I had eaten in the past. I should have cut it in half and taken a picture of it as a cross-section, but I was too hungry at this point to care. It was also a lot smaller than I thought it would be, especially for the price of $6.99 plus tax. Picture something quite smaller than the Burger King Whopper and that’s what it is. Overall, I was mostly disappointed and let down on the general appearance of the sandwich and the amount of bacon. 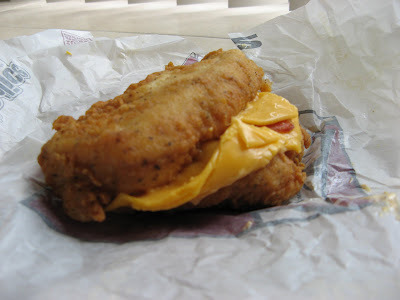 I googled pictures of the Double Down, and American versions don’t really look like what I received. I also stumbled upon home made versions of the Double Down. If you want this “experience” you’re better off trying to recreate it at home. It would be cheaper and more satisfying in the long run, especially when you’re adding your own bacon. So long story short, KFC’s Double Down is not worth it. I kind of want someone to prove me wrong and tell me it was all a bad dream, but un-photoshopped pictures don’t lie. i'm so jealous.......not being sarcastic. how big is a bucket? 10 pieces? aw man, I used to want to eat one . . . and then I read your review and saw your pictures. 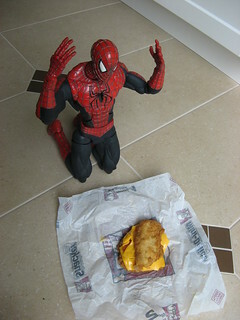 The double-down in the ad looks delicious; the one in your pictures looks disgusting. it doesn't look great, it tasted ok (less than ok? ), but for the price, you kind of expect more....of everything.....and for it to look better.